Star basketball player Blake Griffin is being sued by a man who claims Griffin’s dog bit him at an L.A. restaurant. The attack occurred in July of 2018. Emmanuel Aframian claims that Griffin’s dog bit him requiring him to receive medical care and that he experienced severe emotional trauma from the attack. According to the complaint, this is not the first time Griffin’s dog has attacked or injured someone. The plaintiff is alleging that, despite knowing that the dog was vicious, the defendant made no attempt to train, leash, or otherwise ensure the safety of others. In Florida, if someone is bitten by a dog in public, the owner is strictly liable for their injuries. This means that the owner, regardless of whether they knew the dog was vicious or not, must pay for any injuries or expenses related to the attack. 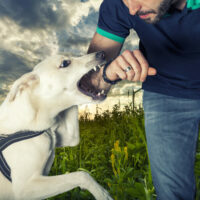 California’s dog bite statute is similar to Florida’s insofar as dog owners have strict liability when it comes to bites and plaintiffs do not need to prove negligence. In strict liability states like California and Florida, the plaintiff can elect to try to prove negligence. Generally, this is done for the purpose of pursuing punitive damages against the defendant. Unlike compensatory damages, punitive damages are not meant to compensate the victim but to punish the defendant. If the plaintiff can prove that there were other victims of the dog, then his case against Griffin is quite good. Not only that, but Griffin was recently signed to a five-year $171 million contract meaning that the plaintiff stands to get a very decent settlement. Punitive damages are awarded to a plaintiff as a way of deterring a defendant from continuing to put others at risk. If Griffin knew that his dog could be potentially dangerous to others, then he put others at risk by allowing the dog to be in public without properly securing it. Of course, different states have different standards when it comes to awarding punitive damages in a dog bite case. In Washington, for instance, in order to get punitive damages in a dog bite case, you must prove that the owner either intended to harm someone, mistreated the dog, or otherwise maliciously allowed the dog to attack someone. In Florida, however, the plaintiff only needs to know beforehand that the owner knew the dog was vicious, prone to attacking people, or that the standard of care as regards restricting the dog was exceptionally poor. Since most dog bite claims are made under homeowner’s insurance policies, punitive damages are usually not pursued as they made jeopardize the coverage. The Miami legal team at Alan Goldfarb P.A. represents those injured in dog attacks. Call us or contact us online for more details.